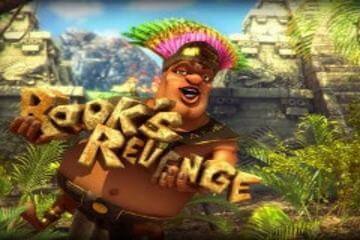 Rooks Revenge is a 3D slot machine made by Betsoft. Following on from the first slot machine featuring Rook, this is bound to be a huge hit. The theme of the game is similar in style to games like Gems in Vegas and DaVinci Diamond slots, with a classic tumbling reel slot format. Rook's Revenge is a 5-reel, 25-payline slot machine, produced by Betsoft. The vibrant game is inspired by the famous civilisation of the Aztecs, and their robust chief Rook. The release is a direct sequel to the highly popular Aztec Treasures video slot that has gained a wide popularity among players. The Aztec theme is reflected in all the elements of the game, including the reels which are designed to look like stone blocks, the immersive soundtrack, and the symbols as well. On the reels you will see the chief Rook himself, seven different representations of Aztec gods that are carved in stone, golden masks, and gold question marks. The latter acts as Wild, substituting for all other symbols to complete a winning, except for gold mask Scatters. The main Bonus features are the Exploding Symbols feature, and the Free Spins feature. In order to trigger the Free Spins, you are required to land three golden mask Scatters anywhere on the reels 1, 2, and 3. During this round, the screen will be changed into a stone wall and you will be awarded 20 free games. Moreover, the Exploding Symbols multiplier will also be active during the feature, with the second, third, fourth, and fifth win being boosted with a 3x, 6x, 9x, and 15x multiplier, respectively. The Exploding Symbols feature is another interesting addition where, each time you create a winning combination, the contributing symbols will explode, while more symbols will fall down to fill up their space, potentially completing more wins. Each subsequent explosion will increase the multiplier by 1x, and the maximum possible multiplier can go up to 5x. The most you can make by spinning the reels of Rook's Revenge video slot is 2,330,000 coins, provided you play at the maximum stake available. Overall, the game bears a similarity to Gonzo's Quest from NetEnt, so, if you've enjoyed playing this title, you will enjoy the Betsoft release even more. The Rook's Revenge is fully optimised for mobile play, so you can try your luck on the go. The only thing missing in the iPad and Android versions are the Chief's hilarious dance moves.